A succulent cornucopia makes a refreshing update on the traditional Thanksgiving centerpiece, and then after the holiday, you can remove the plants and pot them. As early as midsummer, craft stores begin stocking holiday containers like this wicker cornucopia (also available online). I took mine to the nursery and went up and down the aisles muttering, “Succulents that look like fruit.” Surprisingly, I found quite a few. Then at the supermarket, I sorted through gourds for “the best bottoms”—because that’s what would show—and bought a bag of in-shell nuts. I loaded up on sedums in fall colors and an aloe shaped like the basket. But when I spotted a Euphorbia obesa with multiple offsets, I nearly swooned. It was pricey at $12.99, but I had to have it. Just look how it goes with the gourds! 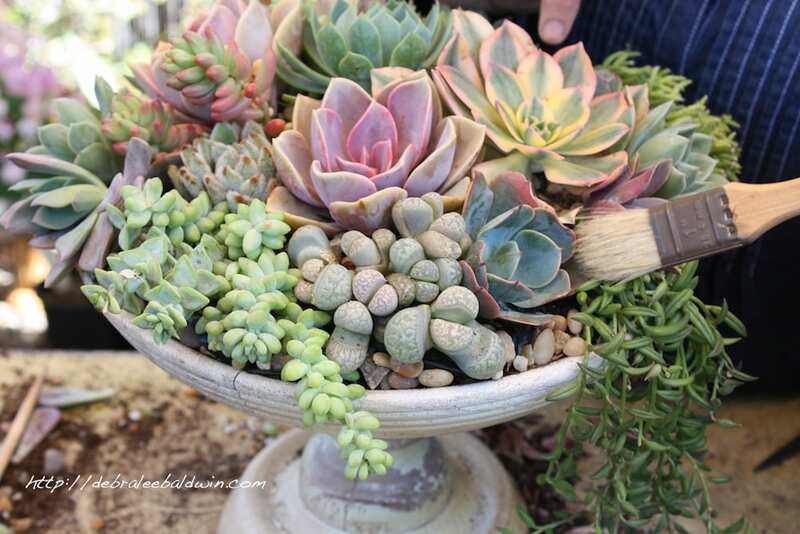 Watch it come together in my YouTube video, DIY Succulent Cornucopia (3:36). After Thanksgiving, you might use the plants to make a container garden like the one on page 229 of Designing with Succulents. For additional inspiration, see my “Holiday Decorating with Succulents” Pinterest board.